the universal truth that no one is perfect. sometimes salted and dried, sometimes just marinated), and tinapa (smoked fish). make them, I make them for myself. sauces, French toast, and pancakes! but ended up being perfect). turn the pancake over and cook the other side until golden. – Serve immediately, hot and fresh from the pan! Note: I love the “How to make a better…” series at Gilt Taste! That’s were I found this divine way with scrambled eggs! say! And vive le pancake! Perfect! Was looking for a good pancake batter recipe. Thanks Joey! They look amazing! Pure perfection. Congratulations on reaching breakfast #64! I love the combination of sweet AND savory for breakfast! That's why whenever I have pancakes, I have sure to pair it with a savory meat like bacon (best pairing! ), longganisa, tapa or tuyo (strange but delish). Wondering on how this recipe with sit well with gluten free flours though. I shall try it with chick pea / gram flour (which is the one I have in our pantry. Hi anartechoke! Lucky you! I can imagine all the great pancake breakfasts you guys are enjoying 🙂 This is a great one to have in your arsenal. That being said it is far from being "think heart" or healthy…they are very buttery, but really quite a treat! Hi Grace! I really like this one…they are really buttery with crisp edges. A decadent pancake 😉 I actually hardly spread any butter on them when I eat them, just syrup! Hi Faye! Very very easy to make…won't take you longer than using a box mix! Hi Didi! Thanks! Pancakes with something savory it perfect! I like to have them with bacon or sausage 🙂 Not sure how this will do with gluten-free flour but let me know when you try! Hi Midge! Me too on both counts! And yes I've read Garlic and Sapphires 🙂 Scotland…how exciting!! Hope you keep us posted through your blog! Those pancakes look great! I am all about sweets for breakfast. There's something about them that just helps me wake up in the morning! I also love pancakes for dinner! What's the thing with men and savory breakfasts anyway? Mine likes savory better although he will eat pancakes when presented with them and I'm pretty sure he wouldn't mind these beauties. They look amazing! I love pancakes! fluffy ones, my wife doesn't like fluffy pancakes. i too use butter in my mix. I saw a tweet from Chef Jaime Oliver on his version of fluffy pancakes. haven't tried it out yet. Hooray for pancakes! I have to say, I also end up eating all the pancakes I make at our house most of the time. 🙂 But that's ok–more for me! Hi Simone! Maybe because they are not as sweet as we are? 😉 🙂 Heehee 🙂 Although I also enjoy a good savory breakfast! Hi Peejay! Ooh! I love Jamie Oliver…will search for his pancake recipe…thanks for the tip! Hi Eileen! Haha! I know the feeling! My hubby doesn't like sweets in general – I hear your pain, dearie! 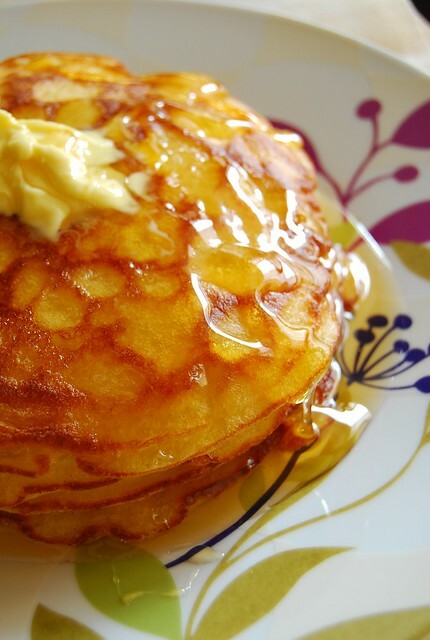 These pancakes look delicious – I would love having such a beautiful stack for breakfast! Prettiest pancakes I believe I've ever seen. If they taste as good it's a winner. Hi Patricia! I'm glad I'm not the only one! I am going to try this pancake recipe tomorrow morning! Looks delicious! Oooh, thanks for sharing this recipe. I'm going to try that sometime. It's so cute how you've categorized your fave foods vis-a-vis the husband's. I just might try to do that too. Hihi. Hi Katrina! 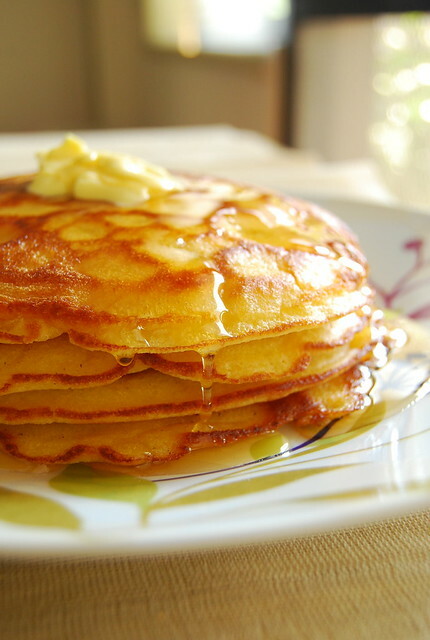 I love pancakes…all types 🙂 But I must say these thin buttery ones with crisp edges are a favorite! PERFECT for Sunday mornings…light and tasty! What a great looking pancake! This takes the ol' flapjack and turns it on its ear. Mutch more sophisticated, perfect for brunch for the "grown ups". Hi! I tried to make these pancakes today but they didn't come out well. I used Bob's Red Mill white flour and a stick of salted butter instead of unsalted and followed the rest of the recipe but the batter was too thin. I like my pancakes with crisp edges and not too fluffy but the ones I made turned out to be crepe like, in a bad way 😛 Help! What did I do wrong? The rest of the batter is sitting in the fridge and I'm contemplating if I should just throw it out and try again. Hi She Said! Sorry to hear they didn't turn out well 🙁 The batter is quite thin but mine came out as you see them in the photo — thinner than regular and crispy on the edges. What you can do is try decreasing the liquid (milk) little by little until you get the right consistency for you 🙂 Hope this helps! Very good because of all the butter we chose not to add anymore. Some used syrup~others used a bit of sugar and a spritz of fresh mmmmM really mouth watering.. We love our pancakes and this was a great recipe. Thank you for sharing…. Hello I like to use buttermilk would I need to add baking powder to do so?